Packaging Equipment Market size is set to exceed USD 47 billion by 2024; according to a new research report by Global Market Insights, Inc. The growing adoption of automation in several industrial sectors is driving the packaging equipment market growth. Technological advancements provide several advantages to the application industries using these products. For instance, implementing smart sensors offers fault detection, data collection, mobile connectivity, remote monitoring, and controlling features, providing efficiency in the processes and operations performed in the factories. Industries using traditional packaging are emphasizing on substituting the legacy machinery with new innovative equipment to enable mass production, thereby propelling the packaging machinery market growth. 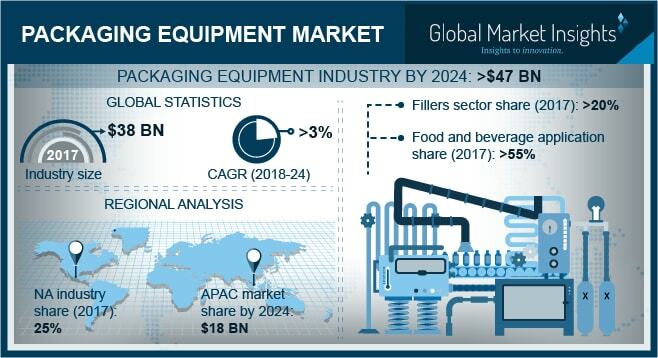 The demand for the packaging equipment market is majorly driven by the development of energy-efficient equipment, increasing the adoption of automated packaging machines and driving the demand for personal care goods. Growing demand for packaging robots from several end-use industries is also a key factor fueling the packaging machinery market demand. These machines play a key role in ensuring product safety throughout the value chain. Equipment manufacturers are emphasizing on offering solutions that have a minimal environmental impact. High costs associated with the development and installation of this equipment are restricting the packaging equipment market growth. Small companies cannot afford to purchase these machines, forcing them to implement manual packaging techniques over automated systems, leading to the adoption of the rental business model. In addition, increasing maintenance costs of the equipment are further hindering the industry demand. Periodical maintenance and checks need to be performed for ensuring the proper operation of the equipment. Palletizing equipment is experiencing a high adoption in several industrial sectors owing to the automated functions provided by the machines. These help in handling heavy loads and stacking cases, bags, bottles, and cartons for packing and labeling of the products. Several advantages of these machines include easy circulation of commodities, manual & automatic handling, lesser risks of product damage, and worker injuries. Several companies are adopting automated palletizing machines to increase their manufacturing capabilities, deliver high-quality end-products, and efficiently manage their processes, driving the packaging machinery market. The food & beverage industry accounted for over 55% of the market share in 2017. The packaging equipment market has witnessed a growing demand for new machinery from developing markets, due to the increase in spending on a wide range of processed and ready-to-go food & beverage products. To satisfy this growing demand, several major companies operating in the food & beverage industry are looking to expand in untapped markets by building new plants and purchasing new machinery. In addition, with changing consumer preferences, food & beverage companies are anticipated to introduce a wide range of new products that require innovative or newer packaging machinery. The packaging equipment market in Asia Pacific is expected to witness a steady growth and will reach USD 18 billion by 2024, owing to the rise in the number of pharmaceutical companies. Countries including India, China, Japan, and South Korea are moving toward automation and adoption of smart industrial solutions in the manufacturing processes. Stringent regulations that mandate pharmaceutical companies to follow certain standards for the packaging of drugs are positively driving the packaging machinery market. Several industrial players in the region are deploying liquid and solid packaging machinery to fulfill the product requirements. Major players operating in packaging equipment market are Bausch & Ströbel Maschinenfabrik Ilshofen GmbH Co. Kg, IMA S.P.A., Körber AG, Marchesini Group S.P.A., Multivac Group, Robert Bosch GmbH, Romaco Pharmatechnik GmbH, Accutek Packaging Equipment Companies, Inc., ACG Worldwide, Svanguard Pharmaceutical Machinery, Inc., Aetna Group, B&H Labeling Systems, Barry-Wehmiller Companies, Inc., Krones Group, GEA Group, and Illinois Tool Works, among others. Manufacturers in the packaging machinery market are targeting their offerings in several sectors and are adopting several strategies to capture the widespread customer base. Companies are differentiating their products by developing several technologies, which will ease the packaging process and improves the productivity. For instance, SIG is planning to deploy IoT technology in its offerings to provide intelligent packaging solutions to its customers. The technology will be provided by GE Digital to integrate it into the machines provided by the company. This will allow the customers to build an end-to-end digital platform, which will provide data-driven intelligent monitoring and controlling of the processes.